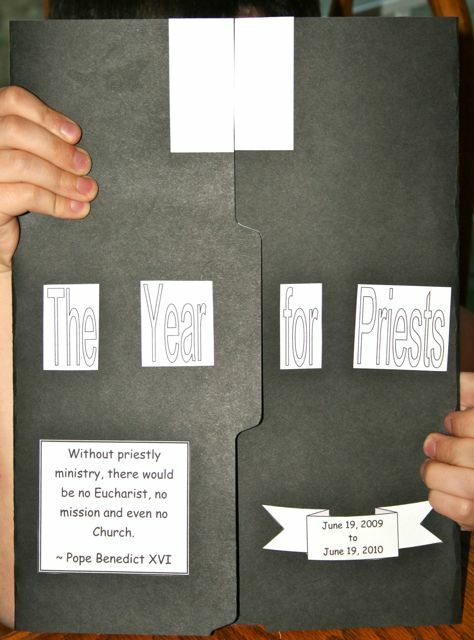 In honor of The Year for Priests, my boys have been studying the priesthood and creating Year of the Priests Lap Books. 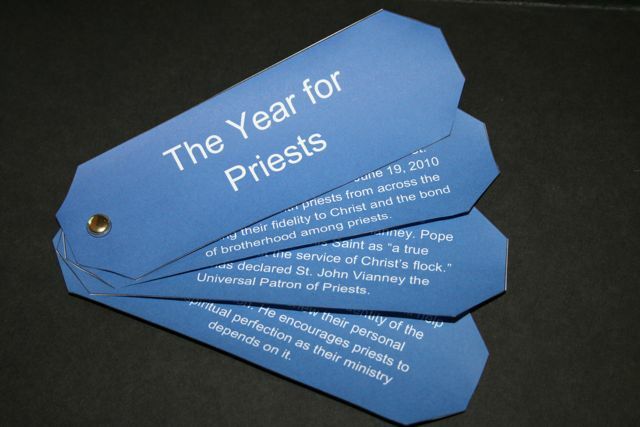 You may remember me hosting a giveaway for this wonderful Year of Priests Faith Folder last June. 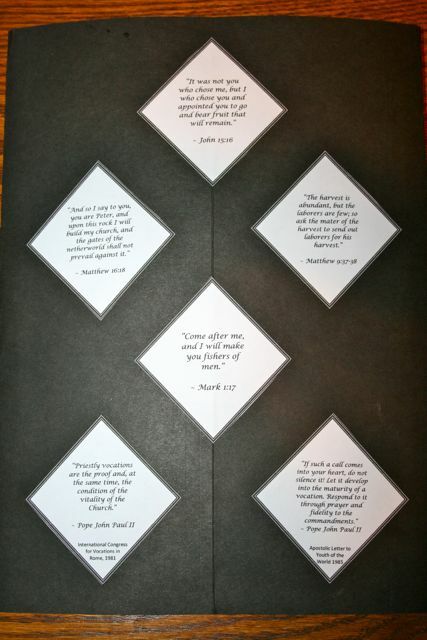 My boys really wanted to use black file folders and add a white "collar" to the top. I loved the idea! Unfortunately black file folders are hard to find around here. I looked EVERYWHERE! I finally broke down and ordered a case online. 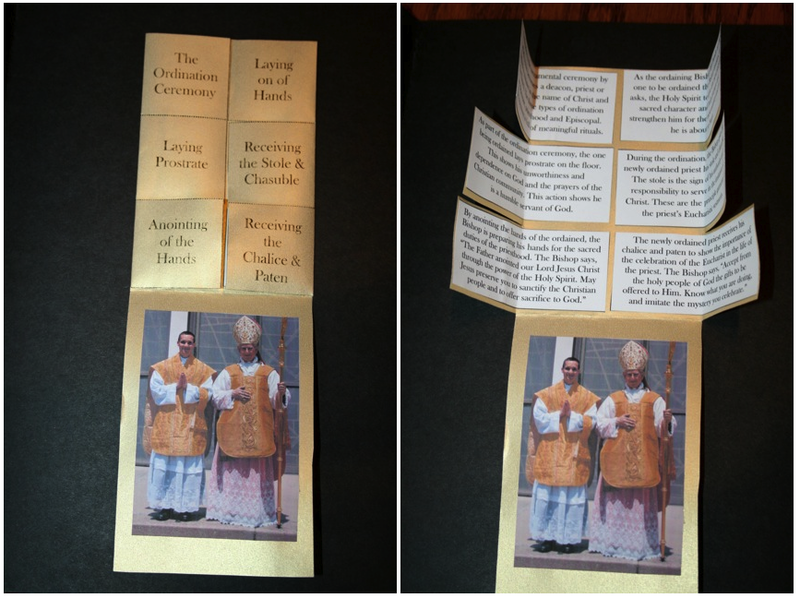 We used two file folders for each Lap Book, cutting the 2nd folder to create flaps inside the main folder. The boys worked (and I helped with some of the cutting) on all the little mini-books throughout the year and had been saving them in a plastic zip-lock. Tip: DO NOT take all the mini books (finished and unfinished) out of the ziplock and leave them on the dinner table while you go grocery shopping. A glass of water just might get dump on them causing quite a bit of extra work. . . In fact, this is why Rascal is still working on his! This Lap Book is dedicated in loving memory of Ryan Barrett. Dear Lord, we pray that the Blessed Mother wrap her mantle around your priests and through her intercession strengthen them for their ministry. We pray that Mary will guide your priests to follow her own words, “Do whatever He tells you” (Jn 2:5). May your priests have the heart of St. Joseph,Mary’s most chaste spouse. May the Blessed Mother’s own pierced heart inspire them to embrace all who suffer at the foot of the cross. May your priests be holy, filled with the fire of your love seeking nothing but your greater glory and the salvation of souls. Amen. I love how the boys wanted black file folders! I know some people have painted manilla colored ones to get what they want, but I'd be afraid it would wear off. This looks like a great product. 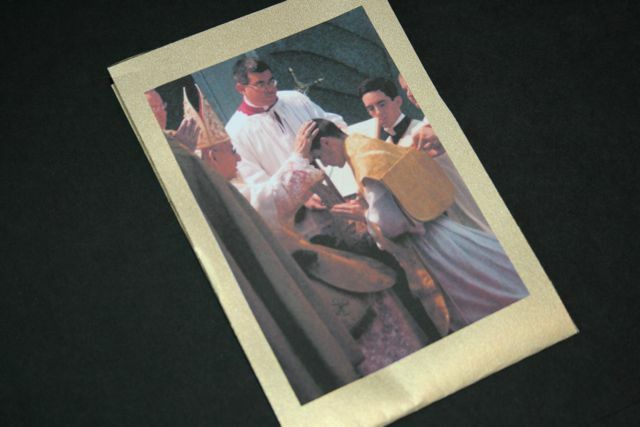 We're just starting the faith folder on The Holy Mass and I can hardly wait for all the learning that should happen. Now I need to see what audios, books and videos I can find for us to watch to really expand the study. 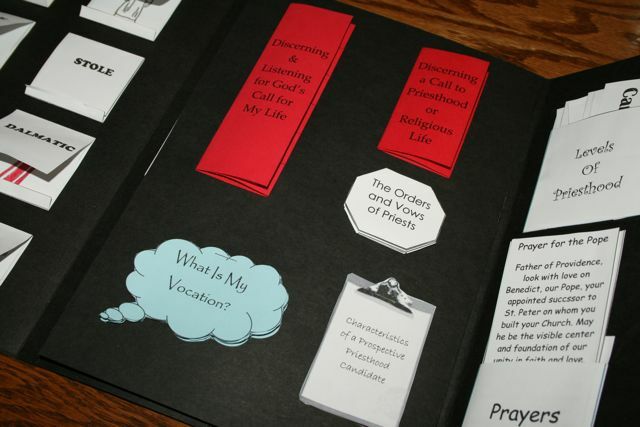 Thanks so much for sharing about this lapbook on your blog! Wow! The thing that caught my eye was the "levels" of priesthood. In the Catholic gradeschools, I was never taught that...nor taught it myself. A very important lesson for children who are not normally exposed to it as your children are with all of those uncles that are priests. What a great project! Especially for your boys! I always think I've seen it all, and then you go and surprise me again, Jessica. You are incredible! What a beautiful job! You must be very proud. Thank you so much for mentioning the dedication. Incredible Jessica! You guys did a GREAT job! Great job! 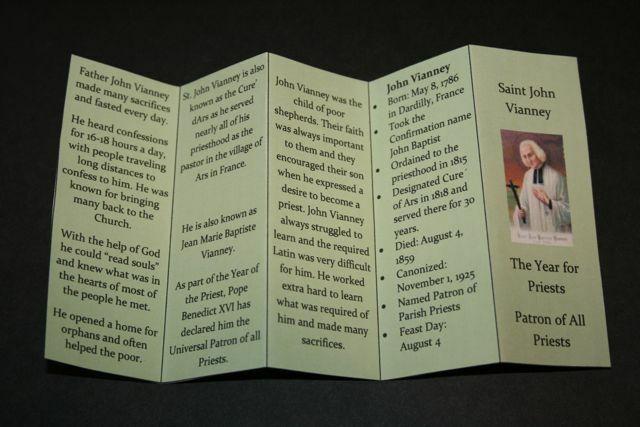 I was wondering if you print your lap book "books" on card stock or regular weight printer paper? 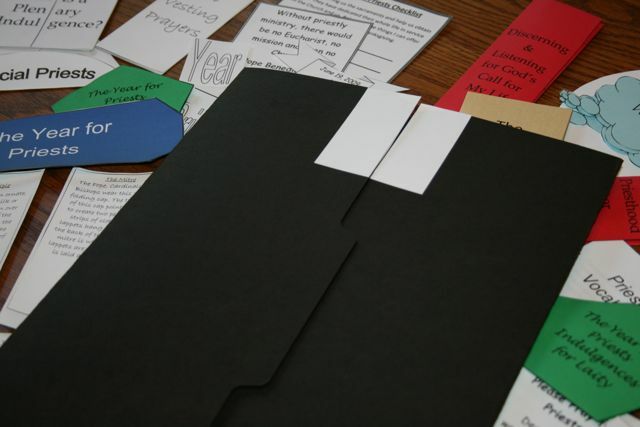 I love the black folders with white collars - what a great idea that is!! 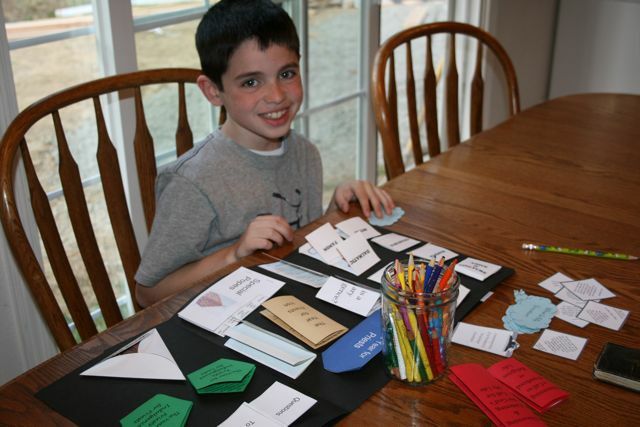 We just finished putting our same lapbook together - our first one ever - and it was lots of fun!! 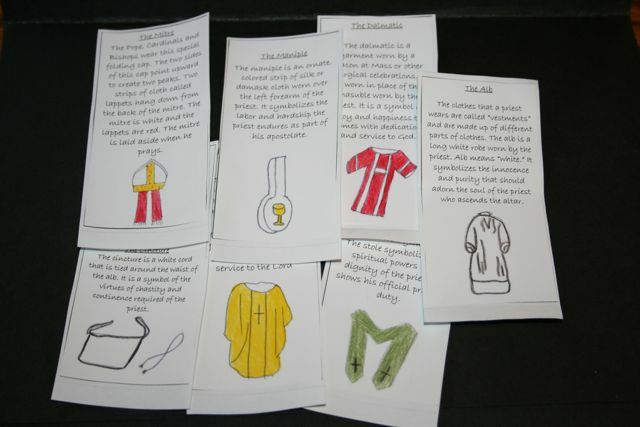 Ours didn't include the maniple, the cincture, and the dalmatic in the vestment booklets for some reason... our little wooden priest figure has a cincture and maniples (which my seminarian little brother insisted I make for it, ha ha! 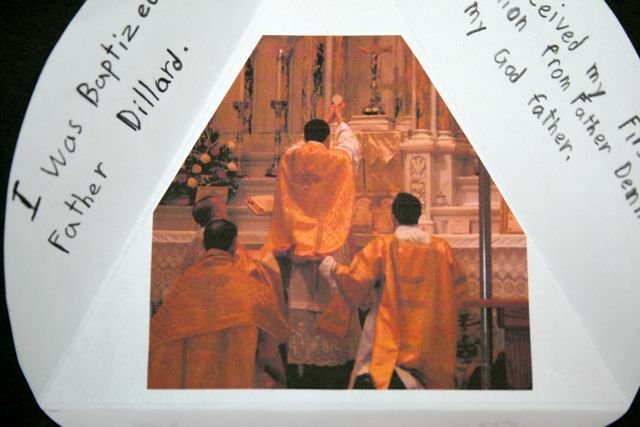 ), so my daughter noticed they were "missing" from the vestments. Kelly ~ It depends on the type of mini book. Most of the books in this lap book are printed on regular paper. With the way that the books are assembled a lot of them are glued back to back, so they are plenty thick and sturdy. 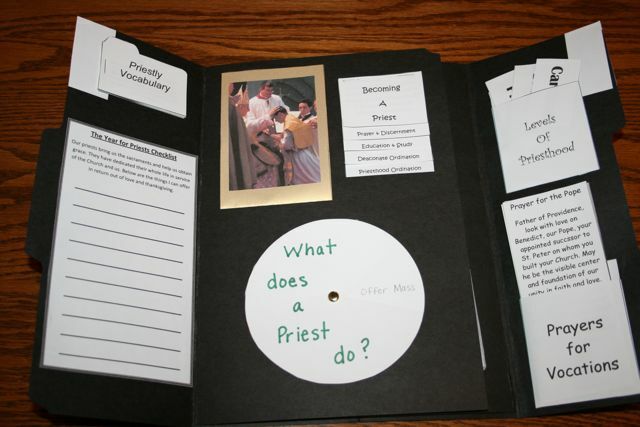 I did print the "What Does a Priest Do" Wheel on Cardstock. I am so so impressed with the work your boys did on this lap book! It appears to me to be very expanded and what a great job they did! One of the best I would guess, although all of the lap books are wonderful. GREAT JOB YOU BOYS DID!!!! great job! Jessica, this is such a beautiful and comprehensive post! I love the black folders with a white collar! 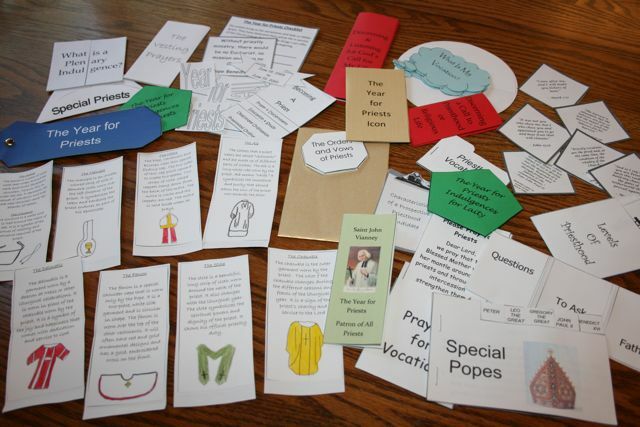 I really love seeing the pictures of completed Faith Folders!